Kate McClure and Mark D’Amico on “Megyn Kelly Today”. Editor’s Note: On Nov. 15, 2018, the Burlington County Prosecutor’s Office announced that the three central figures in this story had been arrested and charged with second-degree theft by deception and other offenses. Prosecutors concluded that their dramatic tale of rescue and redemption had been “completely made up.” Story detailing the findings can be found here. 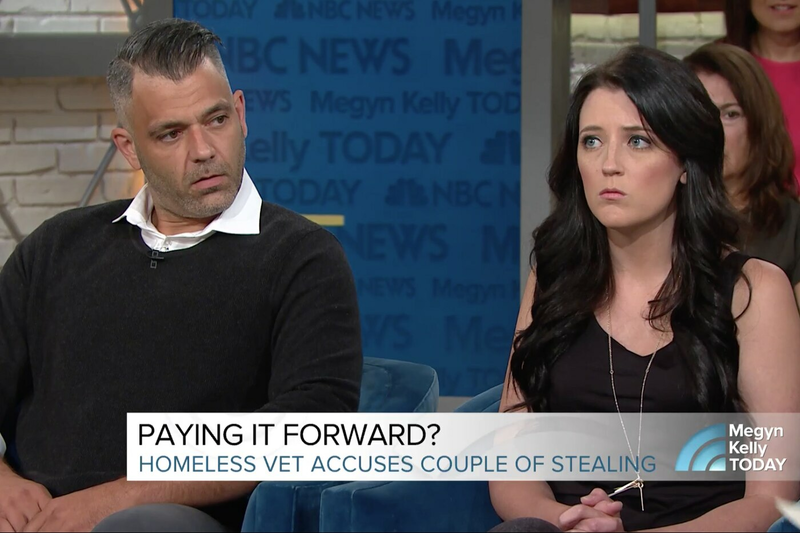 The Burlington County couple who led a $400,000 fund-raising campaign for a homeless man say they will open their books to a forensic accountant to disprove his claim that a large amount of the donations may have been mismanaged over the last 10 months. In an interview on Megyn Kelly Today Monday morning, Mark D'Amico said he and his girlfriend, Kate McClure, will "absolutely" allow an accountant to look through financial statements to determine how the funds were used and how much money remains. Johnny Bobbitt, 35, homeless and struggling with addiction, has alleged that D'Amico, 39, and McClure, 28, took some of the donations for their personal use and refused to show him financial records. The couple started the fund-raising campaign last fall after McClure ran out of gas near where Bobbitt was panhandling, under an I-95 ramp in Kensington. Bobbitt used his last $20 to help McClure, who in turn started a GoFundMe page to get him a home. Jacqueline Promislo, one of two Cozen O'Connor attorneys representing Bobbitt pro bono, said D'Amico canceled a meeting Monday morning to discuss how the donations were spent. Kate McClure rescued Johnny Bobbitt from the streets after she ran out of gas and he used his last $20 to help her. "We also asked D'Amico for an accounting of the money spent, in writing, and he did not respond to that request," Promislo said Monday. She said D'Amico "wrote [in an email] that he would meet once and be done, and only if Johnny was there." The attorneys said last week that if the couple refused to meet with them, the firm would consider filing a lawsuit. Bobbitt has said, and D'Amico and McClure have confirmed, that he began living on the streets again when D'Amico told him in June that he had to leave the Florence property that the McClure family owned and where Bobbitt was staying. In recent days, Bobbitt, Promislo said, has started a new addiction treatment program and is now staying in a hotel. She declined to identify the program or the hotel. "To be clear, the money raised for Johnny was for him to have a home," Promislo said. D'Amico, during a 10-minute interview with Megyn Kelly on NBC, said: "We're in the process of having everything looked over by our lawyer. He has his separate lawyer, and he will have his own trust, and it will be out of our hands." Of the $400,000 raised, D'Amico said, "well over" $150,000 remains. The couple last week told a reporter that they had roughly $200,000 left. Johnny Bobbitt Jr., the homeless veteran who gave $20 for gas for Kate McClure has been back on the streets with his brother Aug. 15, 2018. There were troubles from the start, D'Amico told Kelly. The couple initially tried to open a bank account for Bobbitt, but hit roadblocks when trying to get the required documents in order. "He had no documents, no ID, no birth certificate, nothing," D'Amico said. D'Amico told Kelly the money was placed into "our account." The couple bought Bobbitt a new camper that they put in McClure's name and parked on the McClure property. "If he needed anything, he had it," D'Amico told Kelly. But soon, he said, "red flags" began to appear as Bobbitt fell back into a drug habit. D'Amico told Kelly the two gave Bobbitt $25,000 in December, which he spent in 13 days on drugs in addition to sending money to his family and paying overdue legal bills. The couple tried to persuade Bobbitt to enter rehab facilities, McClure said, but became wary of giving him money. "Every dollar he ever touched was used for drugs," D'Amico said. In April, D'Amico told a reporter that the remaining GoFundMe money had been put into two trusts for Bobbitt. Last week, D'Amico told the same reporter that the trusts were never created. The couple repeatedly have refused to show a full accounting of how the money was spent. In a story published last week, Bobbitt said he did not have access to the money donated to him. He has admitted that he spent some of the money D'Amico and McClure gave him on drugs, but expressed concern over the money because McClure, a receptionist for the New Jersey Department of Transportation, had a new BMW, the couple took several vacations, and D'Amico, a carpenter, appeared to gamble more than he worked. The couple have said they did not spend Bobbitt's money on the car or vacations. D'Amico said he used $500 of donations to gamble at SugarHouse Casino, but immediately returned the money with his winnings. McClure tearfully told Kelly her family has received death threats since the news broke that Bobbitt was homeless again.